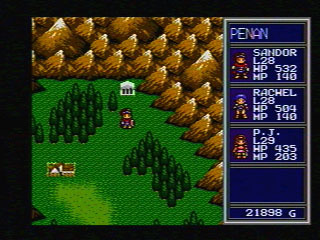 This is one of my favorite RPGs. I played this game several times for two reasons: its challenge and its plot. This is the most difficult RPG I have ever played. Every time you face a boss, you have to raise two levels, I swear! It is indeed frustrating at times to spend so much time leveling up the characters, but I cannot say I didn't know this already after playing it a few times. 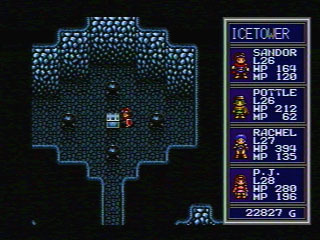 Sometimes I was leveling up not to face the boss, but so I could survive facing the regular monsters at the current dungeon! This game is definitely for the patient. The fact that every time a character goes up a level his or her health and magic points refill kind of helps. Vay's plot, the other reason why I like this game so much, does not disappoint. Playing the game feels like watching a good action film or a good romantic comedy. It's predictable but it's so well done that you don't care. 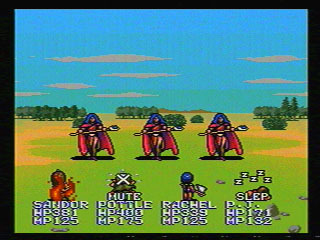 Even since you watch the opening animation that plays before you press the Start button you know you will end up traveling across the land, collect the 5 orbs, and activate the armor which you need to complete your quest. And that is indeed what happens. However, as I like to say, when you create art, you don't have to create anything new. If you make something which has been done before, but do it with care, attention to detail, and quality, you will find an audience and you will bring beauty to the world. Most good movies made right now are like that: only very rarely a highly original movie comes out. The characters' dialog felt honest, down-to-earth, believable, and at times, funny. The voice acting was great. And the character and costume design were very beautiful. The animation was very choppy, though. Most times it was 2 or 3 frames a second, and sometimes it was even less than that; it was like watching a slide show. At the time this game was released, though, it was impressive. The plot, although predictable, had a few plot twists I didn't expect the first time I played the game (and that I was looking forward to experiencing again on subsequent plays). The worst aspect of Vay is its graphics. They are mediocre at best. The colors on the world map and the towns are very few and very bright. They remind me of the colors of the NES, which is one generation prior than the Genesis and the Sega CD. It's almost as if the game was originally made for the NES and halfway through development it was ported to the Sega CD without really improving the graphics. However, if improving the graphics would've meant not releasing the game because its budget would've been prohibitive, I'm glad they released it as is. 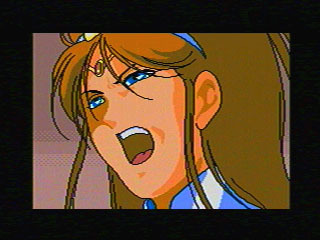 In closing, if anybody who worked at Working Designs during the Sega CD and Saturn eras reads this, remember: your work was not in vain even though you are no longer in business. I miss your games. I will always remember them, and you have changed the world for the better a little bit by bringing these games to the US and giving them your unique style. Thank you.